As temperatures climb in the Arctic, the landscape is becoming unsettled. Literally. On the Canadian outpost of Banks Island, new findings show that landslides have increased an astounding 60-fold in the span of a few decades owing to a series of hot summers and thawing permafrost. As the Arctic continues its great transformation, the landslides are almost guaranteed to become more common. To reach their conclusions published in Nature Communications on Tuesday, researchers used satellite imagery captured by Google Earth Engine. The open source collection of satellite data covers 1984-2016, a period which has seen Arctic warming skyrocket. For Antoni Lewkowicz, the lead author on the paper and a permafrost expert at the University of Ottawa, the time period was also one of personal interest. He told Earther he was doing research on Banks Island in 1984, and the new research gave him a chance to revisit his old stomping grounds. When Earth Engine came online offering time lapse images culled from Landsat and Sentinel satellite images, he also happened to be teaching a class on permafrost. The time lapses afford his students the chance to do real research looking for signs of change. While their research didn’t ultimately end up in the paper, Lewkowicz and his colleagues did their own scan of the time lapses to find “retrogressive thaw slumps”, which is both a great ‘90s band name and the term used to describe what can happen when frozen soil known as permafrost thaws out. These slumps happen when permafrost cliffs begin to degrade, sending a slurry of mud and water tumbling downslope. Once it starts, the process can last for decades and the landslides can stretch up to a mile wide and leave cliffs towering hundreds of feet overhead. Those features are clearly visible to satellites, along with other telltale signatures like bowl-shaped mudflows and lakes turning from deep blue to turquoise because of the sediment pouring into them. The researchers found only 63 active landslide areas in 1984. But over the three decades that followed, that number spiked. Google Earth Engine data revealed that more than 4,500 slumps appeared over the study period and nearly 4,100 were active in 2013, the height of the meltdown. The vast majority of the newly-active landslide areas formed in just a few years, all after 1999 and following back-to-back hot summers. A thaw slump on Banks Island. Which perhaps make it no surprise that as the climate warms, the number of landslides will only increase. By the end of the century, researchers estimate there could be 10,000 new slumps on Banks Island alone even if we start to curtail emissions in the coming decades. “It’s not something that’s going to go back to [how it was in] 1984,” Lewkowicz said while lamenting the “irreversibility” of the changes that are occurring. For the small Inuvialuit community on the island, that increasing number of landslides means it’s becoming more challenging to access parts of the island. The study also adds to the growing list of concerns about permafrost thaw, which could put a third of Arctic infrastructure at risk, including the doomsday seed vault in Svalbard. Equally concerning is what the shift means for ecosystems. 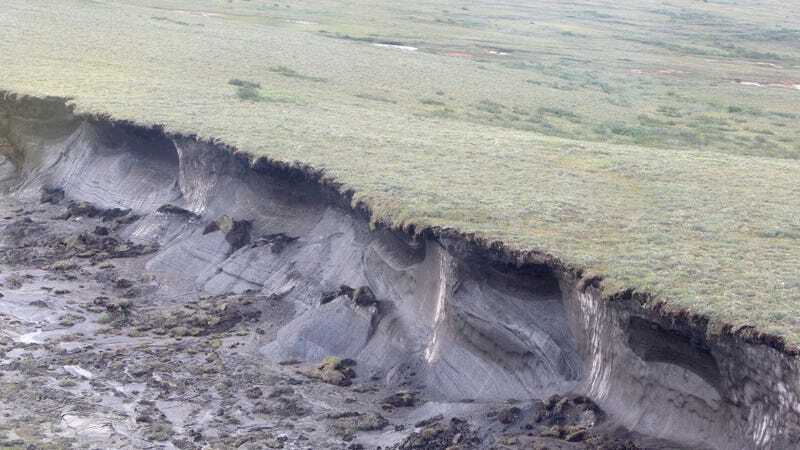 “The order of magnitude increase [in landslides] that we observed and the further increase projected will make these areas of the Arctic some of the most dynamic on the planet in terms of landscape change, with impacts on ecosystems that remain largely unknown,” the authors wrote. While the landslides on Banks Island are dramatic, Lewkowicz noted the problem is isolated to areas where permafrost is partly rich in ice. That means we won’t necessarily see slumps tearing apart the entire Arctic. But in places where icy permafrost exists, the risk of more landslides is real. Lewkowicz said he had this year’s class look at neighboring Victoria Island and the results weren’t encouraging. “We saw a whole bunch of thaw slumps started there linked to [the] same changes,” he said.